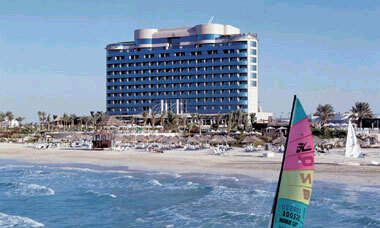 Le Meridien Mina Seyahi Beach Resort & Marina offers both an idyllic location and proximity to the heart of the city. Its 500-metre-long private beach offers exceptional opportunities for diverse water sports. The hotel's wide range of facilities ensures that the needs of both business and leisure travellers are met. Deluxe Sea-Facing - all rooms in this category have an uninterrupted, spectacular view of the sea, the swimming pool and the rich landscaping. The sunsets, enjoyed by most rooms, are not to be missed, especially from the balconies. The rooms are modern in look and facilities include interactive television, satellite channels, air conditioning, minibar, private safe, international direct dial, en suite bathroom and hairdryer. There are two main colour schemes, tawny red and Mediterranean blue, alternating on every other floor. Modem plug-in facility in all rooms through the telephone. Not suitable for three adults.